As one of the largest goose farms in the UK, Daryn and Elaine Williams are running a slick poultry business with future trends predicting they will continue to get bigger. Laura Bowyer visits Monmouthshire to find out more. Daryn Williams has been keeping Christmas poultry nearly all his life. In the beginning he was plucking turkeys in a coal shed with his grandmother before progressing to keep 100 geese about 12 years ago. Today he finishes 8,000 birds all for the Christmas trade. Together with his wife Elaine and children Megan and Daniel, the farm has more than doubled its goose production this Christmas thanks to consumer demand. Madgett’s Farm also produces ducks and turkeys, lying on the English-Welsh border at Tidenham Chase, Gloucestershire, a stone’s through from Offa’s Dyke. They went from growing 100 geese in their first year to 500 the next and turkey numbers dwindled from 1,000 to 500 as the geese enterprise grew. They also produce 500 ducks per week. Daryn says: “The market is growing for geese, but people are still nervous about how to cook them but the market has to be increasing for us to keep increasing in size. With a resident flock of laying geese, eggs are collected and held in batches of 400-500 and then go in an incubator, followed by a hatcher for 24 days. Eskildsen-hybrid goslings, with German blood although UK-bred, are received in March and April for £5 per life, which make up 40 per cent of the year’s goose crop. 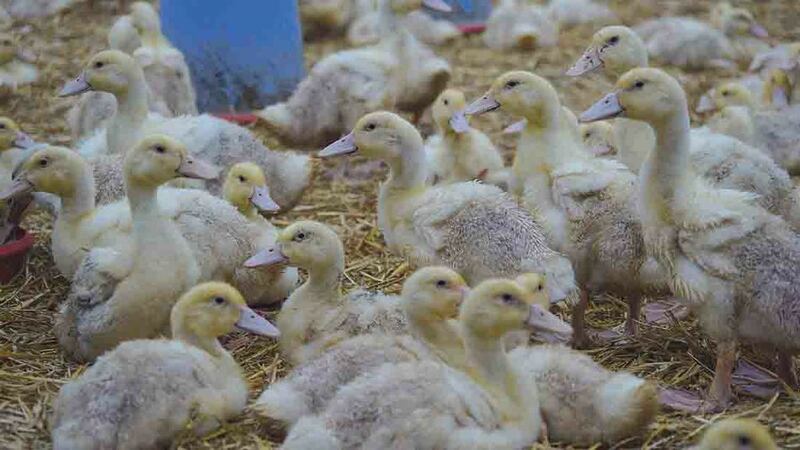 The laying flock produces 60 per cent of the farm’s goslings, while an amount of goslings are also sold off-farm. Daryn says: “British breeds do not put on the weight. Parent stock are taken from Eastern Germany and breed many of our goslings. The UK goose will lose you money hand over fist. “You need a goose to weigh 4.5-5kg in order for it to start making you money, so 2.5kg deadweight. A bird at this weight could be anything from seven months to 18 weeks at its youngest and they put on a lot of weight in the first three weeks of life. 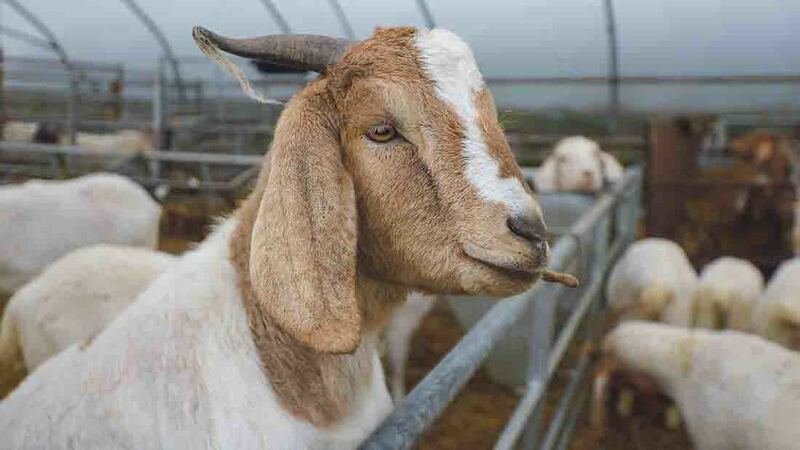 Cereal maize is fed and the protein increases at finishing and at peak 0.5kg is consumed per day. Goslings are bought until the longest day of the year and the last goslings for Christmas will hatch on August 1. Once hatched, they are kept in broods in groups of 200 for one week and then into groups of 2,000, at one month old. They go in clear polytunnels and are allowed out of the pot-holes to roam around grass paddocks, where 600 geese are kept to every hectare (2.5 acres). Little veterinary medicine is administrated, but birds will receive a bacterial vaccination at three weeks. They are fed a starter feed, a grower feed and then a finisher when the geese are put on straw yards to clean themselves off after being out at grass. The flock is made up of both geese and ganders and the couple say they perform to a similar level. 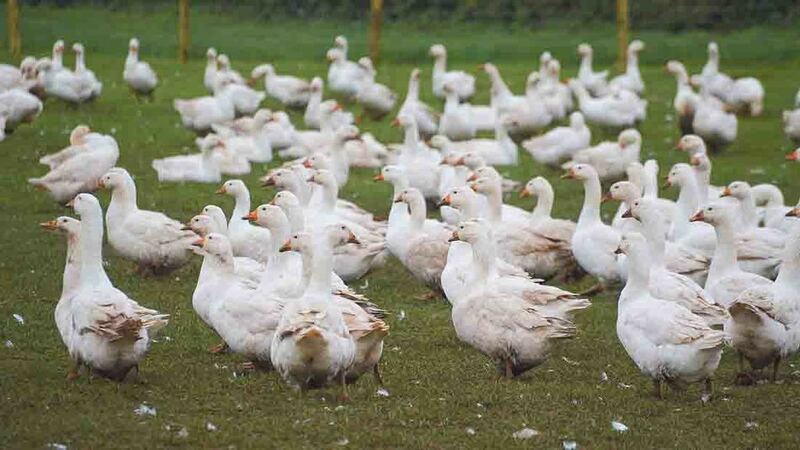 The business’ outlets for their geese include wholesalers and distributors, farmgate sales and farmers’ markets. Daryn’s father Derek is responsible for farmers’ markets, travelling from Cowbridge to Cirencester selling the farm’s birds, but the main part of the business is wholesale with 80 per cent sold in this way. When it comes to the time of killing, geese are caught either late at night or early in the morning, so light levels are low to keep them docile. They are put into modules and transported by a telehandler to the lairage where they are killed on-farm. Once finished, pluckers are employed to take off the feathers before the birds go through a waxing process to remove the finer ones. The birds are tidied up by hand to ensure all feathers have been removed. The process from catching to boxing takes 24 hours, but over the course of two days. Their slaughtering and processing plant can handle 600-700 geese each day, or 100 birds every hour, killing from 9am-3pm. All of the farm’s birds are sold whole and stored on pallets according to weight to facilitate the picking and packing of orders, but they aim for a 4.5kg to 7kg bird. The fat that comes from the bird’s cavity is rendered and sold the following year, while the feathers are collected, washed and sold to be made into duvets. Previous to producing geese, Daryn managed a dairy herd in Cheshire but wanting to determine their own destiny, the pair moved back to Gloucestershire in 2003 and purchased 16 hectares (40 acres) from Daryn’s parents in 2011. After selling at farmers’ markets for 10 years, the couple decided to focus on the wholesale market to allow sale volumes to increase. Now the goose business turns over £350,000, with birds selling at a retail equivalent of £16.90/kg. Daryn says: “Farmers’ markets take a lot of time and prices are cut throughout the day to clear stock and you end up devaluing your product. Elaine takes a sales and administration role in the business, while Daryn sticks to the production side of things. Polish workers come over for the finishing period and 20 are housed on-farm for three weeks. During summer months, it is solely Daryn, Elaine and their children who work at home. Birds do not fly as they are too heavy and neither wings nor claws are trimmed. They behave better in small flocks, of 500-600 birds. Daryn says his aim is to be successful and he says you must be proud of your product. “I have done a lot of things from milking to turkeys and contracting, but I enjoy geese production because you are right at the coal face. “Running a business where every stage of the process happens on your farm means everything is your problem, there is no one else to blame. Every bird going through the line counts. Consequently, any criticism is taken very personally, so you need to make yourself as proud as possible. 100 nannies kid in March and April.